CIC Heat Block addresses all three types of heat transfer- Conduction, Convection and Radiation. It will lower both surface and ambient temperatures from any heat source using both reflectivity and insulating properties. It reflects 97% of solar radiation and has the ability to withstand operating temperatures up to 400° F. When used on hot surfaces such as mechanical equipment the surface temperature can be reduced to the OSHA safety standard. Conventional insulation absorbs heat until saturated and then radiates the stored heat to inside of the space. 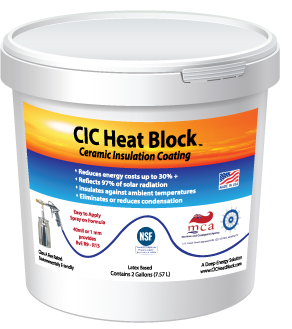 CIC Heat Block has very low conductivity and has excellent initial reflective properties, resulting in dramatically less heat transfer into the building envelope. Refrigeration stays in, sun radiation stays out, hot machinery won’t burn. Keeps heat and cool where it needs to be, thus minimizing temperature and energy losses. Tests have shown up to 30% decrease in temperature, more extreme temperatures provide greater results. You will get greater solar blocking at 110 degrees than at 75 degrees. With extreme temperature difference, surfaces tend to produce moisture, like the outside of an iced drink or outside of an AC unit. An application of CIC Heat Block keeps the cool in and dramatically reduces or eliminates the moisture related to temperature changes. 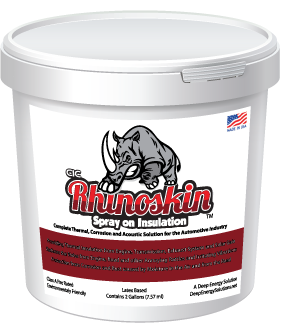 This also eliminates corrosion and mold caused when other types of insulation get wet. 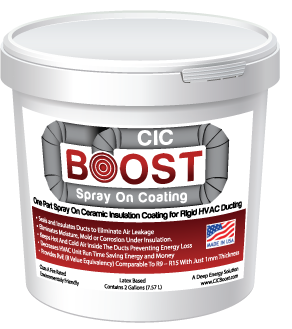 By using CIC Heat Block on the interior of a building or on the housing of equipment that is generating noise, acoustical sound dampening benefits will be noticeable. A good example is using CIC Heat Block on the common wall between a sound studio and clothing store. After an application of 40 mils the sound was noticeably reduced.